If you are traveling long distances, you must clearly understand that flying is your fastest, safest, convenient, and most comfortable mode of transportation. Please remember that nearly 3 million passengers from across the world fly every day and all of them arrive safely in their respective destinations. In fact, ever since airline industry became competitive and started offering affordable fares and many airline companies providing discounts, more and more people are taking to the skies even for shorter distances. In the light of this, there is no need for you to be afraid of flying. While flying, try to keep your mind occupied with something more constructive – read a magazine, solve some crosswords, engage in a friendly conversation with your fellow passenger etc. If you still find yourself fearful about flying, please know there are many helpful resources available for you to overcome your ill-founded fears. 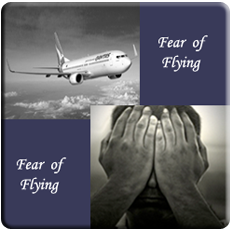 Quite often persons who suffer from a fear of flying also suffer from overactive imagination. For example, if they hear a sudden unfamiliar noise during the flight, they immediately conclude that the aircraft is going to fall from the skies. Treatment methods include virtual reality sessions, private therapy, classroom study, informative guide books, and video tapes. There is also a couple of online program to counsel you and talk you out of your fears. If you constantly brood over your fears they may become incurable phobias. Turbulence is one factor most inexperienced air passengers are afraid of. When there is turbulence, timid passengers feel the plane is losing balance and may crash land. When there is turbulence, please remember that for every down bump there is an up bump. The only unfortunate aspect is people are only obsessed with downs bumps and ignore the compensating up bumps. Be aware of the fact that FAA mandates that all aircrafts are designed and built with large safety margins. All civilian aircrafts and their related equipments are built from FAA approved designs and manufactured under FAA approved systems. The planes are thoroughly flight tested before certification by the FAA. The chances of a plane developing technical snags while airborne are unlikely. When you board the plane mention to the flight attendants about your nervousness and they will let you interact with the pilots. Please know that the pilots are very understanding and will be only too happy to help you feel at ease. In fact, you will be surprised to find out how receptive and cordial the pilots can be. You will be able to overcome your fears once the pilot reassures you about the safety of the flight. One sound advice would be you should visit the local airport a few times and watch first hand how all the planes takeoff and land. After you make a study, you will begin to realize that the flight operations are indeed routine and the pilots are adequately skilled to safely fly the plane. You can even study the Arrival and Departure monitors in the airport terminal to know how many flights operate safely everyday. Remember that fear is a normal reaction to perceived threat. Once you learn that the threat really is not there and it is only a figment of your imagination, the fear will naturally disappear.